Two prominent state lawmakers have drastically different opinions about how many Missourians could be impacted if a proposed voter photo ID measure passes in November’s general election. The proposal Missourians will vote on would require a photo identification to vote. 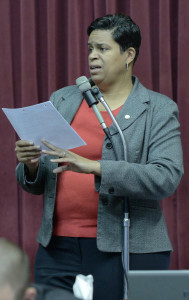 Constitutional Amendment Six opponents, including House Assistant Minority Leader Gail McCann Beatty (D-Kansas City), agree with the Missouri Secretary of State’s projections. “There is an estimated 200,000 Missourians who are currently registered to vote, who will automatically not be able to vote because they don’t have that particular piece of ID right now,” Beatty says. But State Sen. Will Kraus (R-Lee’s Summit) disputes the estimate, and believes no one will be excluded from voting. “To get the 220,000 number, they took inactive voters that may have moved out of the state or maybe they changed their name because they got married, and those are some of the people that he (Secretary of State Jason Kander) has that he’s saying that will go after an ID,” Kraus says. Beatty says Constitutional Amendment Six would affect seniors, minorities and the disabled. “We talk about the Second Amendment all the time and not putting any limitations on it, but it’s ok to put limitations on someone’s right to vote, and it should not be,” Beatty says. Constitutional Amendment Six supporters, led by Senator Kraus, say the measure does not exclude anyone. “Say you don’t want to sign that sworn statement because maybe you forget your ID at home, you can vote a provisional ballot and as long as the signature on file matches the one that the person does at the polls, it will count,” Kraus says. Kraus and other Republicans say photo ID will bring integrity to the election process. Beatty says there is no proof that voter fraud exists. Supporters and opponents of the measure also have different estimates on how much it would cost Missouri state and local governments. The Missouri State Women’s Political Caucus, which opposes Amendment Six, says it would cost more than $5 million dollars annually. The ballot measure language says the costs to state and local government “could exceed” $2.1 million annually. Kraus tells Missourinet he estimates the cost at about $27,000 annually, based on what happened in Kansas. As for Beatty, she tells Missourinet no one knows what the cost will be.